Building a log cabin is a great idea if you have a piece of property to build it on. If you have purchased a property and you’re looking to build a log cabin, looking at different small log cabins online can really help you in your decision making process when you’re trying to figure out different aspects of the design and building process. Also, another great idea is to choose a few different log cabins to stay in for a few nights or more to see how you enjoy staying in a log cabin. Most people choose log cabins like this one called the Mica Mountain Lodge in Tete Jaune Cache, British Columbia in Canada near Jasper Provincial Park in Alberta. There are several different small log cabins like this one to choose from in the camp, and each of them has amenities that make them feel just like being at home. This one has a TV with satellite channels, and some of the cabins also feature a balcony with views of the gorgeous mountains. Inside this log cabin, there’s a kitchen with a toaster and a microwave, as well as a coffee maker and a fridge too. All of the linens are provided, and there is also a bathroom too. You’ll see on the exterior of the cabin. It’s built in the traditional style using square logs with chinking. The chinking is the white material that goes between the logs so that you can create a tight seal in the home for proper insulation. Logs also have their own insulation as well and are known to be great thermoregulators which means that they keep the temperature on the inside of the cabin regulated. So in the summer when it’s hot outside the cabin will be cool inside and the reverse in the winter. This style of cabin is a great option for building a log cabin of your own especially if you like the classic log cabin look. Many, if not most small log cabins built throughout history were built using square logs, but full round logs and half logs were also used as well. You’ll also notice that most modern log cabins will have a steel or metal roof which is great for snowy winters which this area would certainly get. There’s also a great patio on the front of the home as well as ski storage and ski equipment for skiing in the wintertime. It turns out that this log cabin is one of the best-rated cabins in this area plus it’s very affordable to rent out by the night. The managers of the property also offer private tours of the areas surrounding the area. You can check out waterfalls, trails and get your dose of nature and exploring. You may even be able to see some wildlife on the tour. Mount Robson is just 5 minutes away with one of 10 of the most gorgeous hiking trails in the whole world. So when you’re staying in a log cabin to get a feel for what it would be like to have your own, make sure you choose a variety of different styles and sizes of cabin to really feel out what you’d like. Then, you can start to sketch out design ideas and look online for some floor plans and designs. 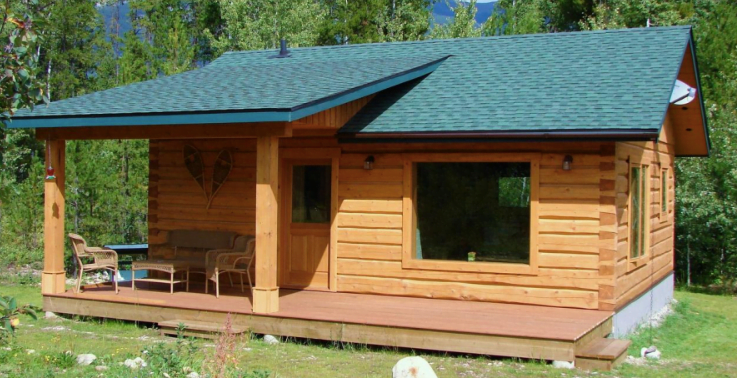 You could even hire a company that will design and build your log cabin for you, or you could even build one yourself from a prefabricated kit. This cabin in the mountains could just be the start of your own personal journey to building a log home or cabin of your very own.